Listen up LADIES! 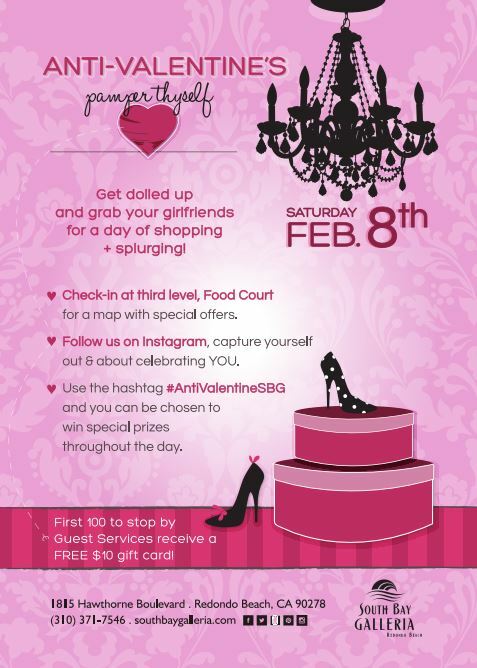 The South Bay Galleria is throwing an awesome anti Valentine’s bash on Saturday, February 8 ALL DAY LONG! There’s going to be an Instagram contest during the event where you can enter to win lots o’ prizes! Be sure to follow their Twitter at @southbaygalleria and tag #AntiValentineSBG on the day of to win! I’ll be there – I hope you will be too!